If you are having trouble with Galactic War in Star Wars: Galaxy of Heroes, here’s a list of strategies to win. You should improve not only your win% but also time spent. Restarting and randomly changing things up does help, but it also takes a lot of time. These tips are written assuming Galactic War is toughest on node 12. If yours is toughest on 11 or even 6, make adjustments accordingly. The concepts still work. 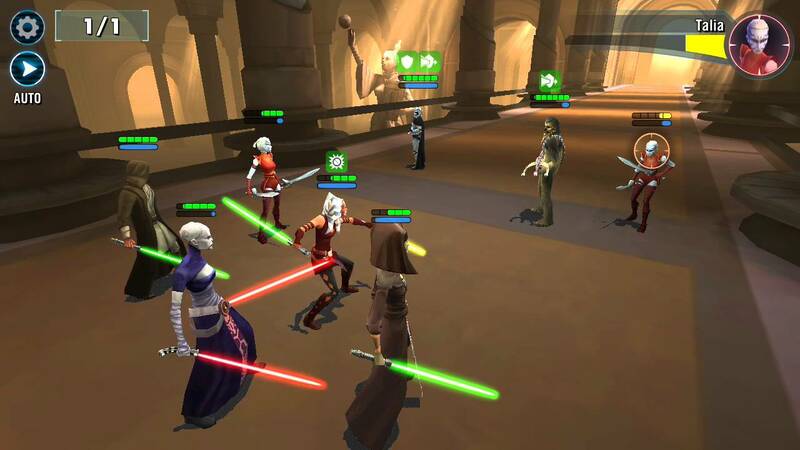 Don’t miss our other Guides to Star Wars: Galaxy of Heroes in our Guide Section. Multiple teams A team and B team for starters. B team characters are not garbage characters. They are decent characters that could be Arena but aren’t for various reasons. They could be missing a star or two, missing some gear, missing a couple of levels, or just aren’t meta. B team needs to be good enough to be able to clear GW nodes 1-11 without assistance. B Team clears nodes 1-11. They will probably suffer casualties on 11, but not too many. They just need to beat it. A Team is reserved for Node 12. This is not only because of protection. You will also need to precharge them. If B can’t get past node 6, you may need to use your precharged A team to clear 6, but then precharge them again using easier nodes at 7 & 8. Healers are usually considered a liability, but you still need a good Lumi or Barris to heal up after a tough Node 6. Healers are not assigned a team though. Precharge the healer so she can come in on Node 7 and heal up immediately after a tough Node 6. Stuns. Characters with reliable stun will preserve your protection for later levels. If stun doesn’t work on the first turns of a match, you restart the node and change things up until it does. It’s that important. It doesn’t matter how powerful their Dooku is if Dooku is stunned the whole time he’s getting beat down. Stun is mainly for health preservation so put your main stun guys on the B squad doing nodes 1-11. Cooldown Management. Each of nodes 1-10 is preparing for the final nodes. Don’t use Auto. Don’t use your cooldowns when the node outcome is no longer in doubt. Save cooldowns for the next node, because you never know when you’re really gonna need them. TM Precharging. During the first five nodes, substitute in each of your A characters and precharge their Turn Meters. Precharging is when the character you’re focusing on has a full Turn Meter when the last enemy dies. If your A sub-in would get the killing blow in a battle, start over and run the battle again. Monitor the TM of the A sub-in and make sure the killing blow comes when that character’s TM is full. If you can’t guarantee that, start over. The point is to start node 12 with a team having full TM on every character. Every member will get at least one turn before any enemy gets a turn. Some even get to go twice or even three times. It doesn’t matter how powerful their Rey is if Rey never gets a turn. With this huge advantage A Team should be able to win the battle without additional help. At least you should be able to take out three enemies before you have to use whatever’s left of your roster to finish off the last two. RNG. The random seed for RNG changes when you swap in a new character. It’s nice to have two DPS characters that are equally good for manipulating this. For instance swap in Leia for Rey in case things just aren’t going your way with the stuns. Swap the same characters around to get different AI behavior. Assist attacks are by slot #, so if you want more stuns swap RG/Daka into that slot to take advantage, or if you can almost kill a character but not quite then swap Rey over to that assist slot to finish the job proper. Read or write comments below for additional details and more tips. What do you think about the Galactic War in Star Wars: Galaxy of Heroes? Do you have any suggestions or feedback? Please feel free to leave a comment below. Be the first to comment on "Galactic War Strategy – Star Wars: Galaxy of Heroes"